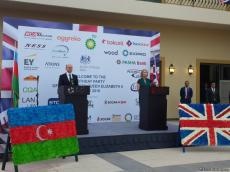 The UK is the biggest investor in Azerbaijan’s economy, Azerbaijani Energy Minister Parviz Shahbazov said June 7 at a solemn reception dedicated to the birthday of Queen Elizabeth II of the UK. He noted that cooperation between Azerbaijan and the UK, in particular BP, played a significant role in implementation of large-scale energy projects. “The recent opening of the Southern Gas Corridor is our joint contribution to the global energy security,” Shahbazov said. The minister added that there is great potential for strengthening cooperation. “The extension of the Contract of the Century until 2050, the signing of a new agreement on the D230 block, and other measures aimed at production and exploration at other oil and gas fields will ensure new stages of development of our relations,” he said. “We also closely cooperate to ensure peace and security at the global and regional levels." "I am confident that mutually beneficial and effective cooperation between the countries will continue in the future."